SpaceX has completed all milestones under a development and demonstration partnership with NASA, clearing the way for the firm to begin regular operational cargo deliveries to the International Space Station in October, NASA Administrator Charles Bolden announced Thursday. Technicians inside SpaceX's hangar at Cape Canaveral are preparing Falcon 9 rocket and Dragon spacecraft for the resupply flight, which is tentatively scheduled to lift off Oct. 8. The Dragon spacecraft for the mission arrived at the launch site Aug. 14. Workers are preparing the Falcon 9 rocket for a countdown rehearsal and engine test firing. NASA and SpaceX managers met in Houston last week to review the outcome of the company's May test flight to the space station, which demonstrated the Dragon's capability to rendezvous and berth with the complex with the aid of the lab's robotic arm. The flight was the final milestone in SpaceX's Commercial Orbital Transportation Services, or COTS, agreement with NASA. 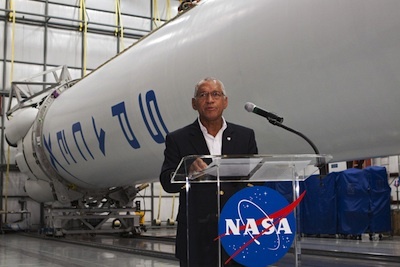 "They have finished the COTS program," Bolden said Thursday inside the SpaceX hangar. "They're moving on to the next phase, which is money for them." SpaceX has a $1.6 billion contract for 12 resupply missions through at least 2015. On the Dragon spacecraft's most recent flight, astronauts unloaded cargo from the vehicle's pressurized module, then it returned to Earth on May 31 with a splashdown in the Pacific Ocean after nine days in space. The capsule carried nonessential cargo to and from the space station on the test flight. The results of the mission will permit SpaceX to deliver more valuable supplies, experiments, and spare parts to the station beginning with the October flight. NASA and SpaceX signed the COTS agreement in August 2006 to fuse public and private funding for the development of a commercial cargo space transportation system for the space station. The space agency paid SpaceX $396 million in installments as the company accomplished design, testing and flight milestones, including two test launches and demo missions of the Falcon 9 rocket and Dragon capsule. "They've met all their COTS milestones, including this year's successful demonstration mission to and from the International Space Station, and they're gearing up now for the first official contracted resupply mission, scheduled around the October timeframe." The COTS program provided NASA funding to SpaceX and Orbital Sciences Corp., which is planning the first launch of its Antares rocket this fall. Orbital's Cygnus cargo freighter will fly to the space station on a COTS demo flight in December, at the earliest, leading to the first of nine operational missions in early 2013.